Five Eagle Creek students placed 1st or 2nd in their division ​among 200 contestants! 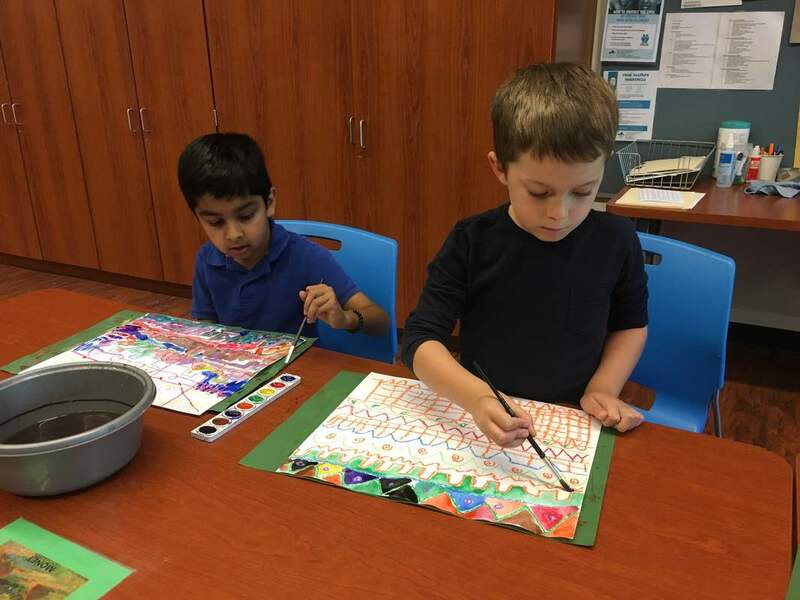 At Eagle Creek, children learn about other cultures and their art. Before making their own projects, our fourth grade students studied the history of weaving and what various patterns mean to different cultures. After studying the art and culture behind Japanese Durama dolls, our 4th and 5th graders created their own dolls and set personal goals to align with their finished creations. Second grade students learned the history of Dia De Los Muertos (Day of the Dead). Then, they created sugar skull masterpieces similar to those used in Mexico. Grade 5 students learned about the architecture of Mexican adobe houses and used chalk pastels to create their own masterpieces. It's fun to collaborate in small groups in art class. 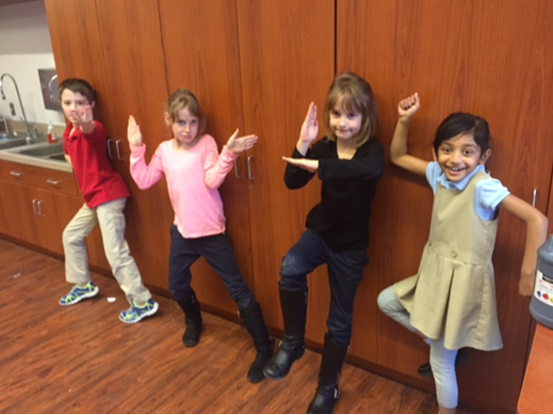 As some of the grade 1 & 2 students posed and moved, the other students drew figures in motion using movement lines. Later, the students made up stories about their figures going places. 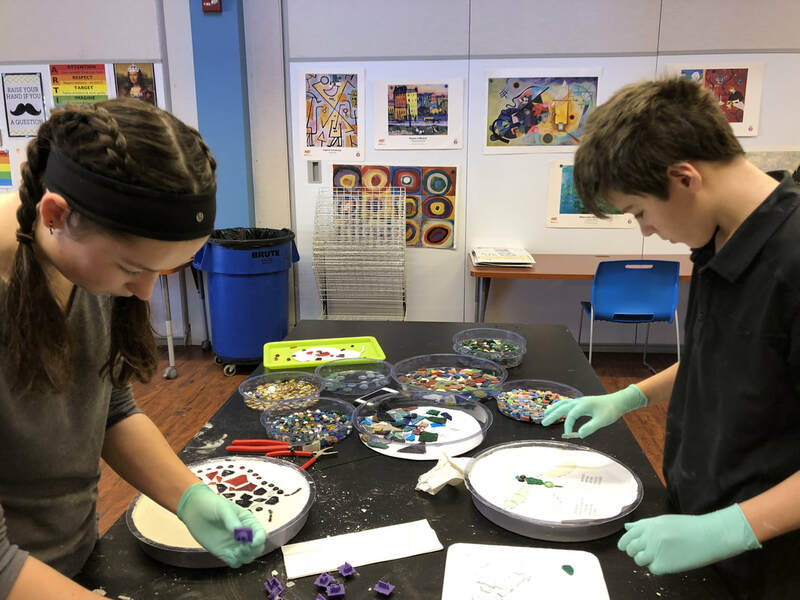 The middle school students collaborated on a stepping stones project, designing their individual mosaics so they would flow as an ensemble to be displayed in the front yard. We work hard to learn the elements of art. 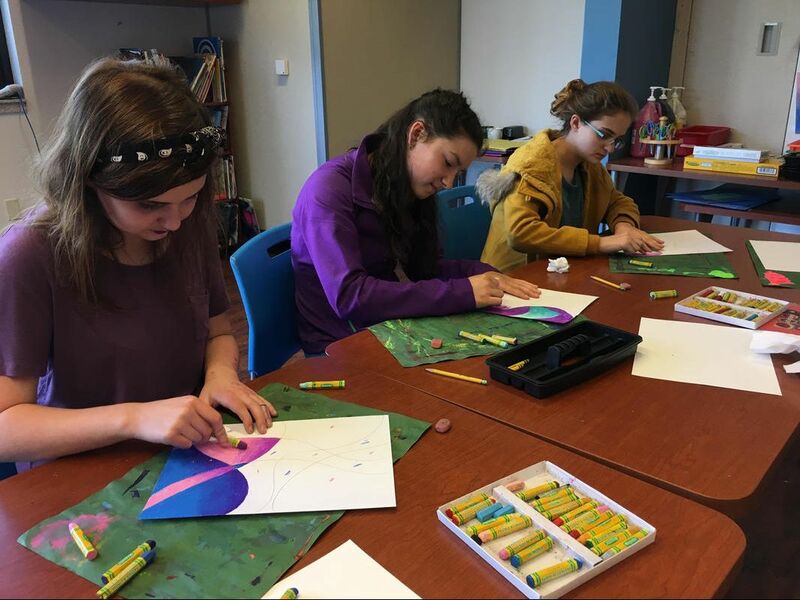 After practicing color-blending techniques and working with the values of light and dark, the middle school kids created some abstract art. 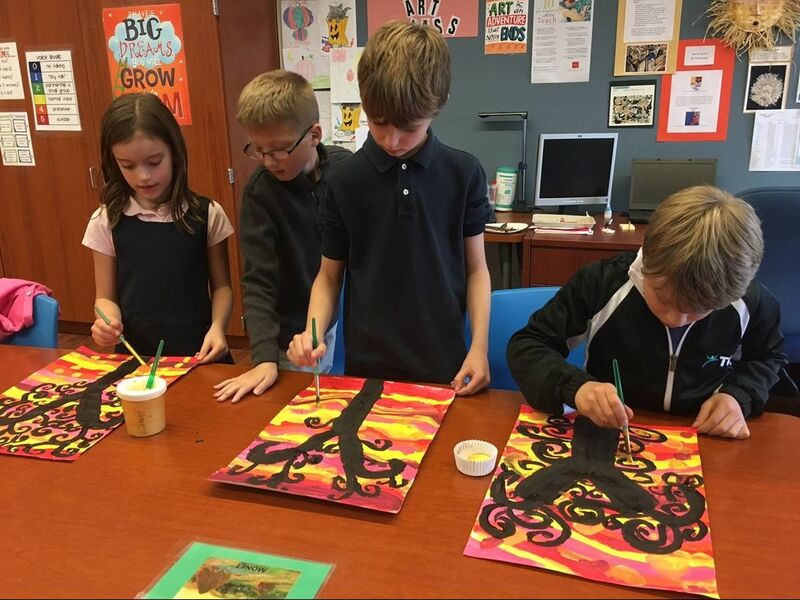 The 3rd grade students learned about the artist Gustav Klimt, studied his famous painting The Tree of Lif, and created their own trees of life. The first graders studied line. 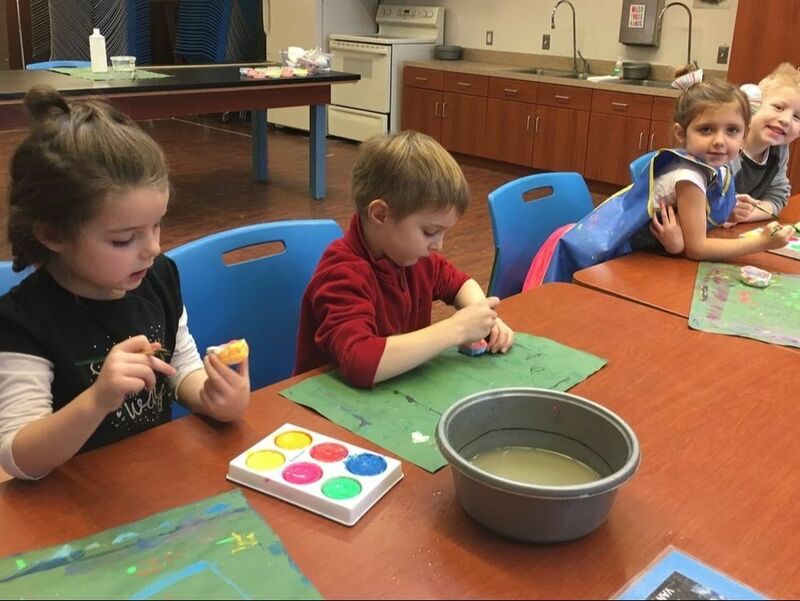 After drawing different kinds of lines, they used bright watercolors to paint their drawings. The KG students practiced methods for creating clay pinch pots. After waiting for the kiln, the children painted the pots with watercolors. 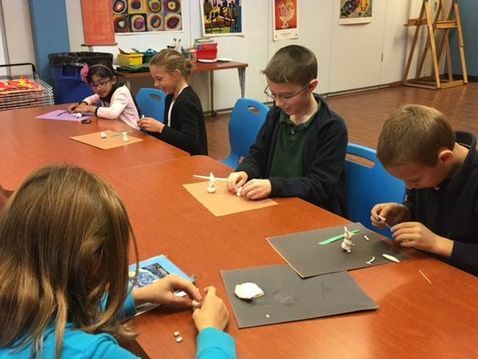 The fourth grade students sculpted 3-D snowmen ornaments using polymer clay. 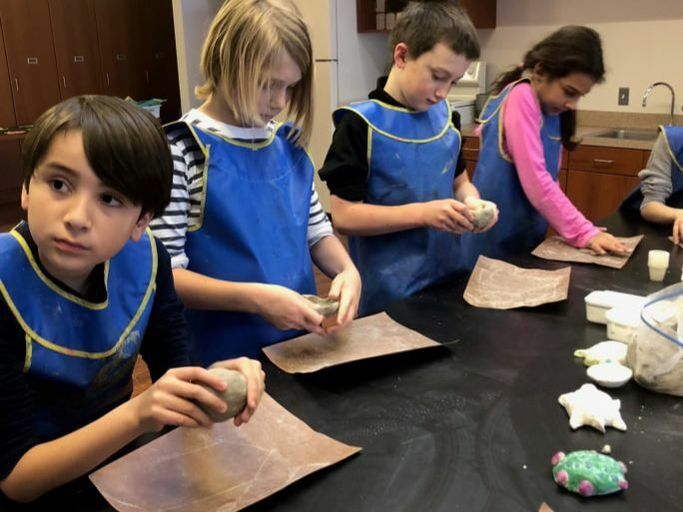 Students in third grade created 3-D turtle sculptures from earthenware clay. Art is a great place to be global. All of our K to 8 students participated in the annual Global Awesome Squiggles project. Students around the world used the same 4 squiggles to create unique art using the medium of their choice. Viewing creations from other cultures was fun and educational. Sometimes, art is just fun! The annual Art Showcase is a family favorite. A small group of children put together an after-school club during which they had 30 minutes to create outfits from art scraps. Afterwards, they played music and put on a fashion show for themselves.